Turkey’s parliamentary election on Sunday represents a critical turning point and may even determine whether Turkey, a country often seen as a model, remains a successful democracy in a region that lacks such examples. For the first time since it took power in 2002, Turkey’s ruling Justice and Development Party (AK Party) might see its support decline. The outcome will determine whether the country remains a parliamentary system buttressed by separation of powers, or becomes a presidential regime under the leadership of former prime minister and current president Recep Tayyip Erdoğan. Erdoğan has plans for a “new” (read: more religious) Turkey; in his view, shifting to a presidential system is a crucial step towards this goal. His critics, however, fear that a presidential system will push Turkey into a spiral of even more authoritarianism, accompanied by an erosion of secularism and civil liberties. For Erdoğan’s plan to work, the AK Party must capture at least 330 out of the 550 seats in parliament (a 3/5 majority) in order to call a referendum to change the constitution. 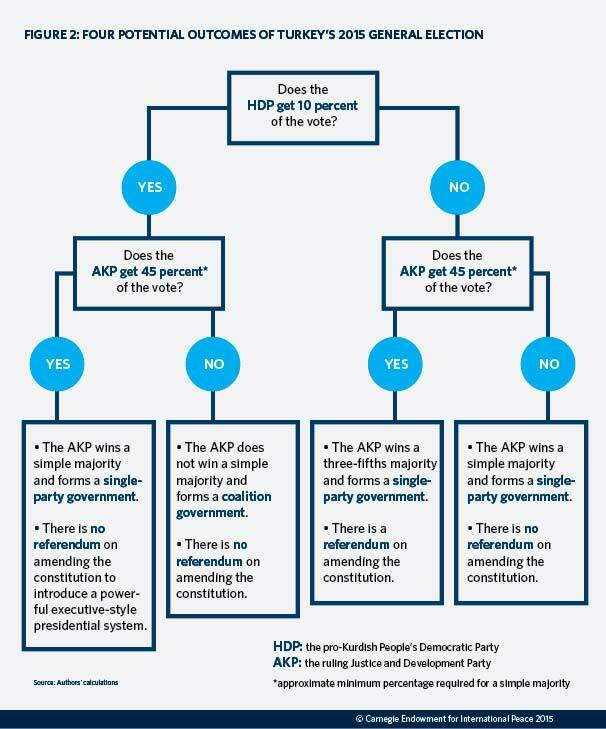 To achieve this majority, the AK Party must win at least 43 percent of the popular vote and the Kurdish People’s Democratic Party (HDP) would have to remain out of parliament. Will the Turkish electorate enable a shift to a presidential system? Turks generally cast their votes based on a given party’s success in boosting the economy. The AK Party rose to power because it promised greater financial stability and economic growth on the heels of a major financial meltdown in the country. Turkey’s economic growth then averaged 7.5 percent per year between 2003 and 2006. These policies were handsomely rewarded, with almost 47 percent of Turks voting for the AK Party in the 2007 election. Elections in 2011 took place when Turkey’s growth rate reached 8.5 percent (coming second in the world after China) and when Turkey was at the height of its international prestige. The electorate rewarded the AK Party with nearly 50 percent of the vote. The government has now won three straight electoral victories—each with a greater margin than before. Today, however, the picture looks very different. Turkey’s economic growth by the end of 2014 had fallen to 2.58 percent. The AK Party missed its key economic targets for 2014 and watched the lira hit all-time lows against the U.S. dollar. An unusually high level of private credit, some of it held in U.S. dollars; falling foreign direct investment; and a decrease in credit flows into the economy make Turkey look economically weak and financially vulnerable. President Erdoğan has not helped improve the economic situation. Instead of aiming for sorely needed structural reforms to boost the economy, Erdoğan has chosen to attack the independence of regulatory bodies, dictate central bank policies, and attribute economic problems to international conspiracies. At the same time, his extravagant spending has attracted plenty of criticism. Erdoğan’s 1,150-room presidential palace, Ak Saray, for example, reportedly cost $615 million and is rumored to contain toilets made of gold. While Erdoğan was leading his lavish lifestyle, the main opposition party—the Republican People’s Party (CHP)—began to articulate a more coherent and imaginative economic policy. The AK Party’s foreign policy has also taken a hit. Turkey is now home to 2 million Syrian refugees and is without ambassadors in Syria, Egypt, Israel, Libya, and Yemen. Former foreign minister and current prime minister Ahmet Davutoğlu’s “zero problems with neighbors” policy is more accurately described as “zero neighbors without problems.” The public is uncomfortable with Turkey’s involvement in Syria, doubts the wisdom of AK Party policies towards Egypt and Libya, and is skeptical of Erdoğan’s desire to become involved in Yemen. Recent public opinion polls show Turks’ nervousness about becoming drawn into conflicts in Iraq and Syria, accompanied with growing support for the EU and NATO—the very institutions Erdoğan derides. There is also public recognition that Turkey no longer enjoys the model status that it once did. Lastly, the AK Party’s efforts to address the grievances of its Kurdish minority through negotiations with the imprisoned leader of the Kurdistan Worker’s Party (PKK), Abdullah Öcalan, have failed to bear fruit. Ironically, Erdoğan’s efforts to cooperate with Öcalan may have cost him some votes from nationalist circles to the benefit of the anti-Kurdish Nationalist Action Party (MHP). These developments suggest that the AK Party will not perform as well as it did in the 2007 and 2011 elections. Yet despite these setbacks, it can still count on its core constituencies and is expected to receive around 42 to 45 percent of the votes on Sunday. This might give Erdoğan the supermajority he needs to transform Turkey from a parliamentary into a presidential system—but only if the Kurdish HDP fails to pass the 10 percent threshold to win a presence in parliament. Polls indicate the HDP gaining support not only from conservative Kurds, who were once supporters of the AK Party, but also from liberal and secular Turks who are concerned about Erdoğan’s politically repressive and socially intrusive policies. There are four potential scenarios that can play out on Sunday. They range from the possibility of the AK Party gaining its desired 330 parliamentary seats to failing to win even the 276 seats required to form a government. In between, it’s possible that the AK Party would retain control over the helms of government with varying majorities, with a possibility of calling for an early election. Regardless of which scenario prevails, Turkey is likely to wake up to a very different political scene next Monday.